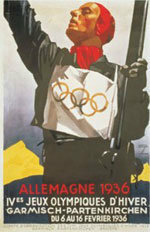 As at the Berlin Games later that year, so the Winter Games were to display Hitler Germany’s greatness and strength. The Nazi regime mobilised a vast support system in order to ensure a «faultless» event. The Nordic skiing relay arrived as an Olympic discipline. But most important nevertheless was the introduction of the alpine disciplines for both women and men.